The Original Stand Steady Folding Height-Adjustable Portable Standing Desk Converter takes all the things you love about our original Stand Steady and adds convenient portability and easy storage. Simply place The Stand Steady adjustable desk riser on any flat surface, set it to your height, and you are ready to work standing up. When you need to change desks or store it away, fold up the legs, grab it by the handle and go! The medium-sized surface is plenty large to hold your monitor, keyboard, mouse, and coffee. 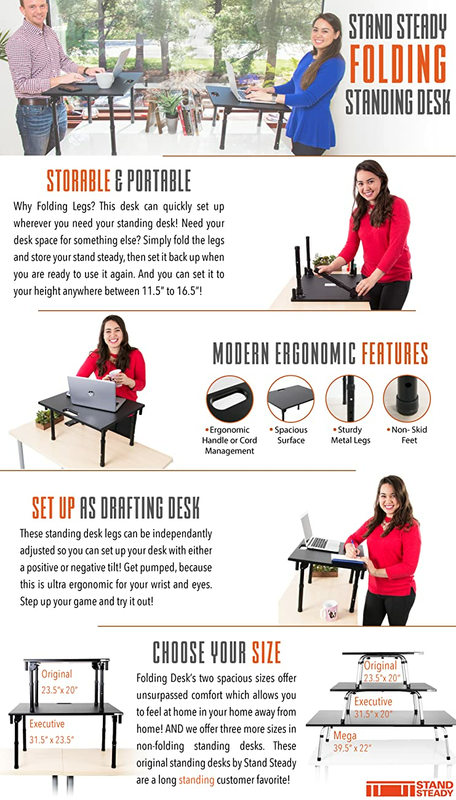 Best of all, it actually increases your usable desktop space by over three square feet because you can stow items beneath the raised platform! It's the quickest, easiest, and most cost effective way to stand up for your health and productivity! FOLDING LEGS & GRAB HANDLE: Our portable stand up desk converter collapses into a slim profile to make it easy to carry and store.